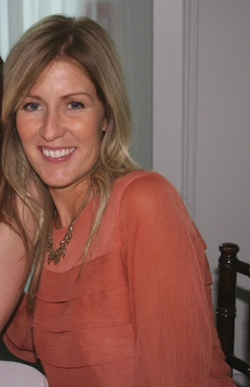 Continuing the ongoing series of interviews with creative artists working on various aspects of movie and TV productions, today I’m pleased to welcome Fainche MacCarthy. In this interview Fainche talks about the art and craft of set decoration, approaching the script, researching the specific era and recreating its look, the shooting schedule, working with VFX department on digital set extensions, the evolving collaboration between physical and digital aspects of modern movie productions, and her work on the recently released movie “Snow White and the Huntsman“. Fainche: I was introduced to an art director at Warner Bros through a mutual friend while I was in school. Within one meeting with her, I knew that I wanted to work in movies. There was something about her, and the way movies were made, and how exciting they were. She was incredibly forthcoming with names and numbers of people and I persisted until someone hired me. My first job was as an art coordinator but I also did many of the plans, elevations and site plans as well as running out for paint, etc. I worked my way up, met a few people, started working on TV shows, and then went out on my own and started decorating. When you’re decorating, you have the final layer on the set. Once all the walls and floors are put down, you walk into this empty space which is so exciting. You start to bring life to the space. I was very drawn to that. I started at the bottom, doing informercials, music videos, commercials and then films. The first proper film was “Alpha Dog”, and then I jumped from big-budget films, to small budget, to medium budgets. So for me it was a mix all size productions. Kirill: When do you usually join the production? Fainche: I’ve had good fortune to work with the same people for the past 15 years, and I’ve developed prior relationships with them. They usually bring me in quite early. The production designer will start with the director, maybe a couple of months before I will. They’ll start putting together the looks for the movie, and I’ll join and start budgeting and putting together my research. The research that I do is very detailed and extensive, and as I’m collecting all the information about the time period – “Snow White”, for example, was 12th century – I begin to put together a very real world for the film. Kirill: How does the usual film script go? Does it delve deep into the details of each set, or is it on a much higher level? Fainche: Scripts are usually around 100-110 pages, or maybe 120 for a longer movie. The writer can’t really go into heavy description, because that would take up too much space. They would give an impression – like walking into the king’s bedroom – and then you come up with your own research, facts and what actually existed in that time period. The look and the specific design of each room would come from the decorator. However, if there’s something pertinent to the film – he picks up his cup from the side table and takes a drink – you know that you need to supply that cup. 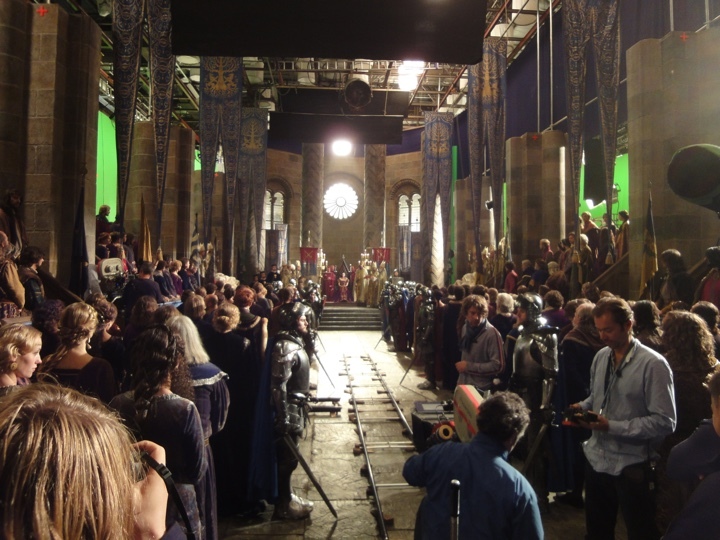 On the set of King Magnus / Ravenna wedding with green screen – built on stage at Pinewood. Courtesy of Fainche MacCarthy. Kirill: And you want to stay true to the specific era, no matter how far back it goes. Fainche: Definitely. We did “Super 8” which was set in June 1979. There wasn’t a single thing on the set going beyond that time. Everything we made was before June 1979 – magazines, artwork, paperwork, furniture, rugs, fabrics. It’s not necessarily that camera picks up on everything, but when the crew and the director walk into the set, you don’t want anyone to find any mistakes in your work. The research that we did for “Super 8” was so extensive, as everything was so different from what we have now – consumer products, the way that we looked, the information that we had. Any time you can do research and really bring the director and the crew as they walk into the set back into that time period, it’s really exciting. And it’s exciting for the actors as well, as they walk in and can get into the character, with every detail around them. You give everyone an opportunity to tell the story and it feels real, it’s grounded in something physical. On the set of King Magnus bedroom – built on stage at Pinewood. Courtesy of Fainche MacCarthy. Fainche: That would probably be my worst nightmare [laughs]. It hasn’t happened though. Snow White is fantasy, and we took ourselves out of the time period now and again. For instance, in 12th century there was no furniture that permanently inhabited any castle – you traveled with your furniture. And you see quite extensive furniture in Kind Magnus’s castle – trestle beds, chests, fabrics, hangings. We tried to stay very true to the time period, and we may have added little things here and there beyond that because it is a fantasy story. If we were doing a period piece based in reality, we never would have done that. Kirill: Was all that furniture built, or did you manage to find some of the pieces from specialty stores or collectors? Fainche: You can’t find the pieces retail because it’s 12th century, they’re priceless antiques. I went to a local exhibit here in LA back in 2011, and to the Cluny museum in New York, and when we moved to London we had the Wallace Museum for armor, and Les Invalides in Paris with armor and weapons. The V&A had a extensive exhibit of pieces from our time period as well. I took photographs and then I designed my pieces. There are a number of prop houses in London, and we were able to rent some replicas of some 12th century furniture – then we built the rest. Making the furniture pieces. The throne (on the right) took 3 months to build and sculpt. Courtesy of Fainche MacCarthy. Our set decoration department in London was very extensive. We had a very large warehouse that was divided. On one end we had our six full-time model makers. Then we had our drape makers, and the furniture that we’ve made or rented. Once we went out to see what we could rent, we would put that look together, and we would start designing the pieces that we wanted to make. I had two art directors in my department, and we’d look at the research and do drawings, and the final construction plans. Then we’d bring them down to the model shop, and they’d build that piece of furniture. We had a mold shop, we had sculptors, carpenters – a really well-oiled machine, especially in London with these talented people. And we were constantly making furniture, like a warehouse pumping out pieces. Ravenna’s throne was kind of our masterpiece. And it’s not just the furniture. There was horse armor, and heraldry – the flags and the shields, which required very extensive research. You have to be very careful not to step on the toes of any of the British monarchy, not to copy anything. 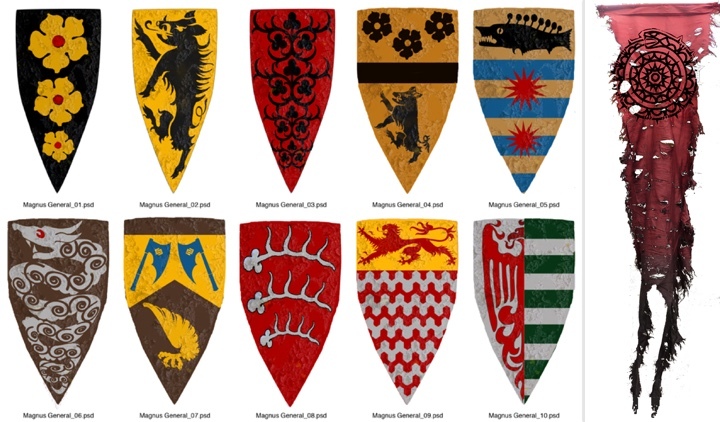 It took us two months to develop the heraldry for all the fiefdoms that existed in Magnus’s realm – for the shields and the flags – a system for each fiefdom. It’s very complicated, and you want it perfect because this is your work. We also had the historian Hugh Doherty, an from Oxford. He came down to the set once a week during prep, and I would steal him for as long as I could to double check my research and designs. I would show him everything we were doing for the flags, for the shields, for the weapons, for the horse armor, and he would provide his opinion on what was right. He was telling us about this historical bits, giving us ideas to make the group movements more authentic. Left – flag and shield design for different fiefdoms. Each design went through multiple iterations. Right – Ravenna’s heraldry. Courtesy of Fainche MacCarthy. Everything was real, everything was based in history. The only thing that we elaborated on was a few pieces of furniture in the castle. Also, army horses in 12th century did not wear armor yet – that started in 15th century. But we thought that King Magnus’s army would look more glamorous in armor, so we built enough armor for fifty horses, and dressed the rest in caparisons – silky robes with heraldic stamp on the rump. Our drapery department did that, and an outside shop did the armor, and the leather workers did the bridles and the harnesses. It was a massive amount of work, and a very expensive part of the film – just to show the magnitude of the horses and how powerful Magnus’ army was. The armor took so long to build-it was months and months of design and manufacture. It was our first priority. Then we designed the weapons with Tim Lewis from Simon Athertons shop, and had Tim physically manufacture them for all of the characters and the army as well. That also took months to do. Left – shield and armor design for different fiefdoms. Right – a fully dressed horse on the set. Courtesy of Fainche MacCarthy. Kirill: How long was the pre-production stage for Snow White? Fainche: For me it was about nine months. And we had just enough time to prepare everything. If you can imagine how long it takes to design armor – to go through the research, and put the look together, and to sit down with illustrators, to have everything approved by the director, to hire master armorer to build the real armor, to adjust and adjust and adjust it, to mold lighter polyurethane material that looks like metal armor. It takes so long, and that’s why you have to have that time. Any movie from that time period is very extensive on prep. Kirill: Would you say that it’s been the most labor-intensive production so far for you? Fainche: They’re actually all labor-intensive. On Snow White I’ve built probably 75% of everything you saw on camera, whereas on other movies such as “Super 8” you can find more pieces. You might need to make certain things, like articles, consumer products, graphics, magazines and artwork, but you don’t need to make too much of the furniture. And on Snow White we had to make the furniture and the armor and the weapons and a lot more. You work hard on every movie. Super 8 had only nine weeks of prep, while Snow White had 9 months. However, they are all equal in their labor, to be honest. Kirill: Jumping a little bit forward, was there any difference in the amount of digital set extensions between these two productions? Fainche: Super 8 was a smaller budget, and we had to build and shoot most everything practically. Of course, the alien was brought to life by visual effects, flying furniture, set extensions in the tunnel or for the tower, the explosive scenes. You try to do as much practically as you can, because it can be cheaper, and then what you need to extend, you do. When you see the castle in Snow White, that was built by VFX. When you are standing in the castle courtyard exterior and inside the rooms of the castle, those 30′-0″ walls were practical. Dominic Watkins and Dave Warren with a team of art directors and talented construction and scenics, plasterers, etc built Ravenna’s castle in a parking lot at Pinewood. The scale was massive so the armies could charge in and out and Rupert the director could feel and shoot the scale of a 12th century castle. They built up to 30 feet, and once you see above that, visual effects took over. Most of our shots, however, stayed in practical world. We were constantly taking the walls on one set and creating new sets with them. We tried to recycle everything to save money. Most of Snow White was shot in Pinewood in London. We didn’t shoot in any castles except St. Bartholomews for the Snow Whites Interior death scene with the Huntsman. You can’t shoot in a 12th century castle. There’s no light, there’s no electrical to power movie lights, and you can’t run a bunch of generators inside. It’s too impractical, and even if you do find a castle like the one in Wales we wanted to shoot and didn’t, it was five hours away, and you have to have an entire company travel. It’s actually cheaper to build it and to have total control over it, especially if it’s a repeat set. When you have actors, the crew and the horses, moving them can be very expensive. Kirill: What happens when the shooting starts? Are you on that primary set, are you moving to the next one? Fainche: If it’s a new set, I always start the morning on that set, to open it and make sure everyone’s happy. And then I move on to the next hundred sets that we need to do [laughs]. You try to prepare yourself so well that you are really ready ahead of time for each set well before it shoots so that you are just putting the finishing touches the few days before. However if construction is down to the wire, then it pushes Set Decoration into much less time for prep. When you start shooting, you prepare maybe 30% of the sets upfront. The idea is on day 1 of the shooting, you’re concentrating on preparing for day 20. You have to keep on jumping ahead. And the last day of shooting, when you don’t have any more sets to do, it’s this crazy feeling. You’ve been so completely buried, running around, with so many things coming up every day, and then you are done! Kirill: Was it simpler for you to move between the sets since it was on the same studio lot, as compared to moving between different geographical locations? Fainche: We actually had multiple forests, flew to Wales to prepare the horses and the armor, St Bartholomews for the interior Snow White death scene, and Frensham Ponds for the Burka Village. We were running between those and the main sets at Pinewood. 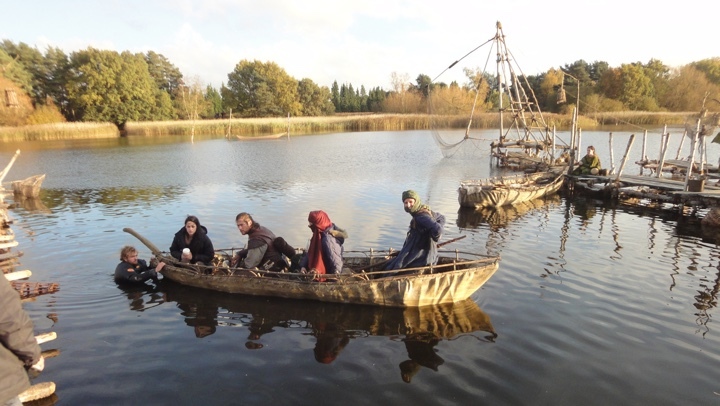 The big burning village at Frensham Ponds lake was an hour from Pinewood. There was nothing there – just beach, weeds and water – and we built a massive village into that location. I would start my morning at Frensham, get going with the model makers, Buyer, prop makers, drapers, set dressers, and scenic guys to discuss our day and what we wanted to accomplish. It was pouring rain every day, and we were in tents with all our dressing and water in our boots, wading into the set while dressing, working to make the set look authentic. On the set of Burka village. Courtesy of Fainche MacCarthy. Kirill: Did you only have one chance to burn it down for the night raid sequence? Fainche: The pyrotechnics special effects units rigged a number of the huts with flame bars covered in straw. We burned them during the night, and we could reset the fire every time pretty quickly. It was controlled burn, they knew exactly what they were burning. We had these beautiful pieces of furniture for day shoots, and at night where everybody is trying to escape the fire we pulled some pieces away do they wouldn’t get damaged. The pyrotechnics would fire up the flame bars, and that’s what you see in the shots. The structure below the bars was charred, so we would need to retouch and rethatch for the day shoots. We tried to do our day shoots in a row to get all that done, and then move to nights. You have to schedule the night shoots together so that the crew can get used to doing that, and then you go back to days. Kirill: A lot of action is happening in the forest. What do you do there outside the walls? Fainche: We used the woods, or whatever section of the woods we were in as a backdrop, and then we built our set in the clearing. The Great White Father tree where Snow White sees the big white buck (which was visual effects element) was in a big clearing. Dominic would illustrate what that would look like, and then the greens department and construction built the big giant tree in the middle – a three-foot diameter tree about 20 feet tall, with visual effects extend the tree to the height you see it in the film. We built the water trough and the stepping stones, greens brought trees from Ireland to create a magical garden in the Enchanted forest. And then you have the dark forest with scary-looking trees, with claws and hands and the snakes – all of that was sculpted and visual effects brought them to life. The construction department sculpted those trees for months before installing them, and once you install them, you have to paint them and do ground work – massive amount of effort. It’s a never-ending job. Kirill: So when you talk about sets, it doesn’t matter if it’s built inside or outside. Fainche: Everything on camera is a set. There is always something to do. Kirill: Stepping outside the specific production and into the topic I brought up earlier. You’ve talked about having digital set extensions, with VFX taking over at certain heights. I keep going back to “Sky Captain and the World of Tomorrow” that attempted to do everything on green screen, and was perhaps way ahead of its time as far as the actual capabilities of VFX. Where do you see this going? Fainche: I think it works better as a partnership. When I see film that is all effects, I don’t totally believe it. When you’re looking at the frame through camera, and you have some sort of physical environment to stand in, I think it works much better – to have that partnership. It’s really exciting when you can have that cooperation with visual effects. When everyone is trying to hammer out who is doing what, and how much visual effects is going to do, you take all the numbers and crunch them down to see what makes the most sense financially, and for the look of the film, that’s where it goes. I think it’ll always be partnership, unless VFX really found a way to make everything so real, but it wouldn’t necessarily save money to do that. On Snow White we had five VFX houses working to get the film done. You’re farming out work to every single one of them, and there was no one shop that could handle it all, and the expense of it was massive. And they’re also going through their own kind of learning curve, what they’re willing to do financially. There’s definitely going to be some changes, but combining the practical world with the effects world is the best in my opinion. Mirror room. Courtesy of Fainche MacCarthy. Kirill: Do you go over each set in the pre-production planning to compare the costs of doing it practically vs. digitally? Fainche: You never budget everything out as if you’re doing it all digitally. You budget it out to do what you need in your department practically. The sets you know you can’t do physically. You don’t want to build animatronic trolls, for instance, or the Dark Fairies, or obsidian shards. We dropped fake glass shards to give Cedric Nicolas-Troyan in visual effects something to grab on to. The troll bridge was a massive undertaking for VFX, and it was beautiful. They did an amazing job. Cedric directed a lot of the second-unit action scenes on Snow White. He really understands the physical production as well as the digital world. He’s very well-rounded. It’s a really nice collaboration, and it worked really well on Snow White. We knew each other, and we were very passionate to do our best work. You do budget everything out, and once all the budgets are submitted – visual effects, art direction, set decoration, special effects, costume – then you can look at it all. If it’s $5M to build something, and visual effects can take some of that money and build the extension above 30 feet to save $1M, that would be the way to do it. We didn’t have the time or space to do the entire castle practically, so you have to let some of it go. Kirill: Some VFX artists talked about the future where they have vast libraries of digital artifacts that can be combined together at will to create any environment you can think of, bringing down the costs dramatically. So that hasn’t happened yet. Fainche: When you look at the queen’s castle up on the hill in Snow White – that is all VFX. We shot plates in Wales and VFX designed the castle in the location digitally-it worked quite well. Because of the advances in VFX, they are expected to do more than what they did 10 years ago. However, real locations modified by design are still so beautiful. You always needs to go for the best production value and weigh that against the cost to build practically or go for VFX build. When you look at the first Star Wars, it’s beautiful. The design is so epic. And there were a lot of plate shots and matte paintings, and it was all very beautiful. And there’s this expectation that VFX can do everything, but there’s a limit to what they do financially, and there is a limit to what we can do practically with time constraints and budget. Whatever any of us do, there’s going to be a number to that. And as a producer you need to figure out which cost and look will best serve the film. What is the best way to do it? That’s what it comes down to. Your job is to hit your number and make the movie look the best it can. It does come down to money, but as the head of set decoration, for me it comes down to what’s going to look best on film as well. I have to weigh both options, know what to fight for and what to let go of. It’s always a collaboration. Built-from-scratch Duke Hammond’s tent, including furniture and maps. Courtesy of Fainche MacCarthy. Fainche: We talked about doing Snow White in 3D, but Palak Patel at Roth Films, the studio, and Rupert [Sanders, director] decided that they wouldn’t do it. They didn’t want the film to be 3D, rather shot practically. But “Pirates of the Caribbean” and some of the other larger movies have expectations to do 3D. I don’t see it benefitting anything from set decoration or art direction standpoint. When you do 3D, you have to layer your set a bit differently. You have to work with foreground elements, with midground elements and with background elements. You need to give your director of photography and your director something something to pop. You do that on a regular film as well, but it’s a little bit different. As a viewer I enjoy them to a certain extent, but I would enjoy them as much in 2D. I don’t try to get into a 3D film more than a regular 2D, but I do see value in them. Fainche: Definitely. If it’s not done well, I’ll notice it more. And if something is done extremely well, and I’m just watching, I really respect all the different departments that put it together. I probably go to 3-4 movies a month. I want to go and see what everybody else is doing, what the other decorators are doing, to see everybody’s work. 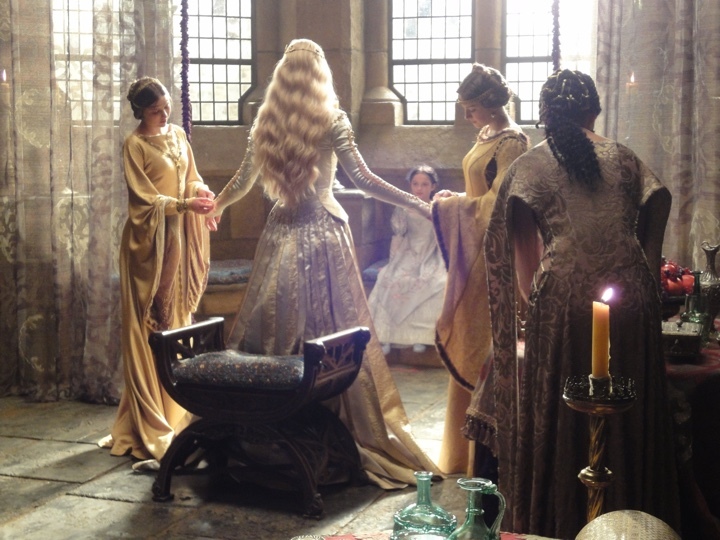 On the set of Ravenna’s chamber. Courtesy of Fainche MacCarthy. Kirill: And outside the realm of movie theaters, even as TV screens keep on getting bigger, a lot of people are watching movies and TV shows on a variety of smaller screens. Is this a consideration for you, not to bring too much detail into the set and have it lost on smaller devices? Fainche: No. I put as much detail in every set as I can, and it doesn’t mean that I’m cramming every inch of every plane with stuff. I’m putting the right things in the right places. Even if you’re not seeing it, and I know that camera is not going to see it in the end, I’m still going to go as far as I can with it so every corner is shootable and so that when everyone is walking through the set, it’ll ground them in the space where they’re meant to be. That’s my approach. I always go for the detail. The most important thing for me is that the director loves the environment that we’ve created, that our collaboration in the art department has given the look of the film everything that it can. On Snow White there were certain colors that we needed to test on film before you shoot, because red might read black or blue might read black, and you’re not seeing the colors that you put in, and it’s a problem. And through experience you know that certain things don’t look good on film. I don’t really think about if you’re watching it on a smaller screen vs. a bigger screen. I just want it to look amazing no matter what your screen is. Maybe that’s more relevant to people who do TV, although I am not experience in that genre. My approach is to give all the detail that I can. Kirill: Do you look at the dailies? Fainche: I try look at the dailies every day. We have a system where every department head can check their work, and it’s really important. If you see that certain things are not working, you pull them out to do something differently the next time. It’s good so that we’re all on the same page about what we’ve shot. I’m not standing on the set the whole day, I just can’t do that – we’re always prepping the next set. Kirill: But you don’t stay through digital intermediate, grading or coloring in the post-production. Fainche: That’s a whole other team. It’s incredible to have such a separation between practical and post. But on Snow White I did know a lot of people on post, so I popped by to look at the dailies, at how the Dark Fairies were shaping up. Cedric is very passionate and forthcoming. and he wanted to show those. We had a lot of screenings before the movie came out. There was one screening where most of the effects haven’t been finished yet, so you saw drawings placed here and there. It was really interesting to see what Cedric and Gloria [Borders, producer] had coming up, what they were working on that month. I was maybe more involved in seeing this post than in Super 8. When the filming of Super 8 wrapped up, I moved to London to work on Snow White. Kirill: And then it can take months as the studio decides what’s the best time slot for it. Fainche: We pushed our film forward because of Mirror Mirror. Our bungalows were 500 yards apart at the backlot of Universal, and each side was thinking “what are they doing”. And we didn’t know that theirs had a much lighter mood than ours. We had no idea what they were doing, and they had no idea what we were doing. And then we went to Comic-Con to get a glimpse at the movie, to see the vibe of it. But initially we didn’t know that we were not in the same time period. We were very secretive. Armor sketches for the horses. Courtesy of Fainche MacCarthy. And here I’d like to thank Fainche MacCarthy for graciously agreeing to this interview, for taking the time out of her busy schedule to talk about her craft and for sharing some of her materials for the interview.